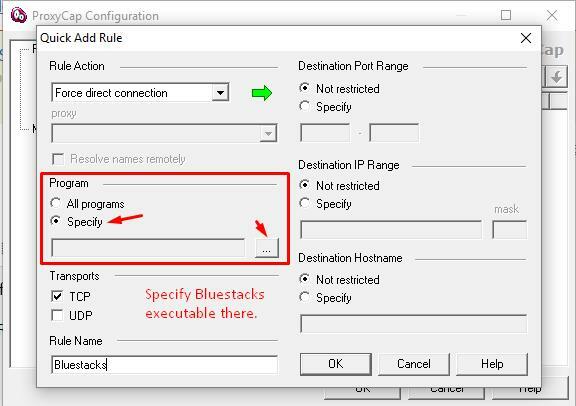 I've been searching how to connect Bluestacks by using Proxycap, but it so difficult to practice. Is there any easy way to configure it? The ProxyCap application is, in fact, very easy to use. Once the program is started, click on Proxies on the left and add your own proxies (HTTP or SOCKS). Once the proxies are added, you need to create a Rule, therefore click on Rules. The ProxyCap application is, in fact, very easy to use. Once the program is started, click on Proxies on the left and add your own proxies (HTTP or SOCKS). Once the proxies are added, you need to create a Rule, therefore click on Rules and follow the guidance as shown in the image below. Is it possible to synch Bluestacks with my Apple ID? While installing Bluestacks, it displays 2 GB of physical memory required. I have only 1 GB RAM.